Central idea: Resurrection from the dead. Doctrine: Death and hope in our own resurrection. Practical application: A proper awareness of death. To view the Lectionary 34 readings, click here. This passage foreshadows the doctrine of the resurrection of the dead, which God revealed to his people little by little (CCC 992). It is hard to see the connection between sin and death. But this psalm and the entire Deposit of Faith claim that the ultimate cause of every human suffering is sin. The collective impact of sin even makes the innocent suffer. The ultimate human suffering is death. The solution to sin is the Redemption, which includes both the forgiveness of sins and the elevation of human beings to eternal life with God. This psalm can be read in many ways with its plea from “out of the depths” and its waiting in darkness “for the dawn.” Three such ways are the plea of any person on the brink of death; any soul in Purgatory; and Lazarus between his death and his resurrection by Christ. The spirit, the Spirit of God, and the Spirit of Christ mean the sanctifying grace we received in Baptism through which we share in God’s life. The flesh means our condition before Baptism. Through the Sacraments, beginning with Baptism, the Spirit of God, the Spirit of the one who raised Christ from the dead, dwells in us. This is why we hope in our own resurrection from the dead. Our spirit, however, can become dead because of mortal sin committed after Baptism. Christ gave his Church a sacrament for that: Penance or Reconciliation. The death of Lazarus was an evil that deprived him of life, grieved his sisters, and robbed the world of the good he could have done. Christ restores to him the human good that is lacking: life itself. This is an example of how God draws good out of evil, thereby giving glory to Himself by benefiting man. Why did Jesus wait to go to Bethany? Perhaps for two reasons. One was that he had people to serve right in front of him where he was. Another was he wanted there to be no doubt that Lazarus was really dead. Even thought all living things on earth die, and even though we will all die, death is not natural to human beings. “As a consequence of original sin, man must suffer ‘bodily death, from which man would have been immune had he not sinned’” (GS18) (CCC 1018). 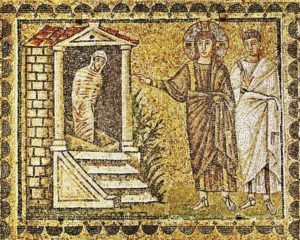 In the raising of Lazarus, Christ reunited this poor man’s body and soul and regenerated whatever corruption his natural body had suffered. Lazarus was restored to corruptible life, the natural life we live now. Lazarus was restored to natural life but he would have to die again. His “natural” resurrection is a sign of the Resurrection of another order, the order of being incapable of dying again. Christ’s Resurrection is of this other order. We are promised to share in this new order through Jesus Christ. We are on our earthly pilgrimage. This is our “time of grace and mercy” in which we work out our “earthly life in keeping with the divine plan . . . and decide [our] ultimate destiny” (CCC 1013). With Gods’ helping and healing graces, our work is to do good and avoid evil. Our work is to love God and neighbor properly. We prepare for heaven by doing good. We prepare for hell by sinning.